The Book Club on Race is a project of The Village Square, supported by a grant from the Knight Foundation through the Community Foundation of North Florida. This project would not be possible without our ongoing partnership with Leon County Government, through the national award winning Club of Honest Citizens. In the years prior to the American Revolution, one of its preeminent architects – Ben Franklin — informally gathered interesting people in London to think. They called themselves the Club of Honest Whigs. Out of social events like these came ideas like police & volunteer fire departments, the first public libraries, hospitals and universities, paved roads – even the discovery of oxygen. Like Franklin, we think brilliant ideas can come from riveting conversations with our neighbors. In the spirit of Mr. Franklin and the tradition of invention and association that has always made America unique, the Club of Honest Citizens joins citizens with their elected leaders and government for “Company, Chat, a Laugh, a Glass” and “wise Sentences.” You can view pictures of the 2016 Club of Honest Citizens event “Created Equal: A conversation on race + founding ideals + our hometown” here. The photograph, taken in 1955, depicts the Barnard School in Washington DC, shortly after integration. The photograph was taken by Thomas J. O’Halloran and is made available through the Library of Congress. We find this picture so riveting because of the easy hopefulness of some of the children in it, probably now approaching 70. 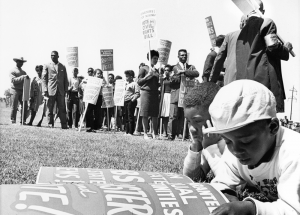 The photograph was taken at an NAACP demonstration in Tallahassee, Florida in 1965 to protest the U.S. Senate filibuster over the civil rights bill. 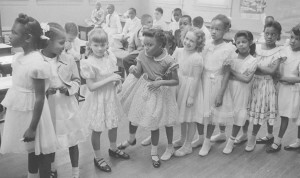 Photo: State Archives of Florida, Florida Memory; photographer is unknown. 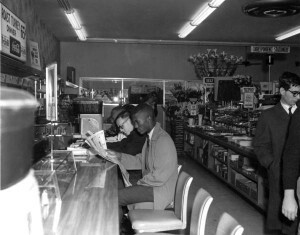 The photograph, taken in 1960, documents a sit-in by Florida A&M University and Florida State University students at Woolworth’s lunch counter: Tallahassee, Florida. When they failed to leave, 11 were arrested for “disturbing the peace by engaging in riotous conduct and assembly to the disturbance of the public tranquility.” Photo courtesy of State Archives of Florida, Florida Memory; photographer is unknown. 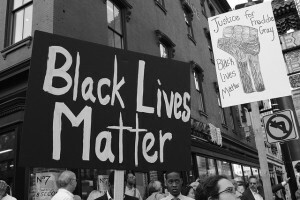 The photo was taken in April of 2015 in Washington D.C.’s Chinatown neighborhood for a March to show solidarity with the Baltimore protests after the tragic killing of African-American youth Freddie Gray. Photo credit: Stephen Melkisethian under Created Commons License 2.0. Photo adapted from two “Unlearn Racism” photos by Joe Brusky, used under Creative Commons License 2.0. The photographs of the March on Washington are rare public domain images of the event and of Dr. King. They are public domain because they were taken by an unnamed photographer for the US Marine Corps. A nervy bunch of liberals and conservatives who believe that dialogue and disagreement make for a good conversation, a good country and a good time.